This first semester as before has been eventful and has brought us its share of good and bad surprises. The major highlights were the main refit of the hull with a number of discoveries once it was above water, the reorganisation of the medical team, the installation onboard of a dental practice and the start of the school year with the selection of 12 orphans whose schooling was sponsored thanks to those of you who chose to help these children. The return to the site for the major refit lasted much longer than expected and finally the boat was grounded from 25th March to 4th May, 6 weeks in total. The refurbishment of the hull was done in the allocated time, between 2 high tides, between the new moon and the full moon. Only during these days is it possible to have the opening of the watertight doors which allow access to the hold. After 21 months at sea, the hull badly needed a renovation. A number of panels had to be replaced, and sometimes very large pieces were corroded not by termites but by the water which can damage the hulls of wooden ships sailing in the delta. 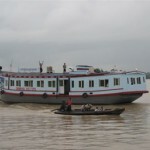 The hull was refurbished for the second time and having being rejuvenated, Swimming Doctors rejoined the dock of the Botataung pagoda port. The purpose of this important downtime is the changing of the propeller shaft, the repairs of the gearbox and the motors of 2 out of 3 of the generators we have on board. The gearbox posed the greatest worry for the mechanics. Between the shipyard and the port, and despite an initial repair, the gearbox did not hold for a 2 mile distance. It was necessary to completely redo it. As often there are no original spare parts it is necessary to have them made which has been the case for the propeller shaft like for the gears of the gearbox. Given this stop was far more important than planned, Swimming Doctors only sailed 92 days of the 182 of this semester. Despite everything 1,992 patients were treated, an average of 332 patients per mission even if a number of them were shortened. It emerged over the months that we should amend the constitution of the medical team, as one of the young doctors had the opportunity to become medical officer. 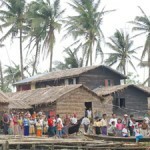 However, two indigenous doctors plus a foreign voluntary doctor was too much, given the remote villages where we go. Thanks to the departure of the doctor, we were able to put our new organisation in action with the addition of a dentist to the team, a great plus for our care given in the villages. Since the mission 19 started on May 26th, the medical team consists of 1 doctor/surgeon, a dentist, the above doctor Si THU, plus a doctor or voluntary foreign dentist (the candidates are welcome knowing that it is for a minimum stay of a mission, so 22 days onboard), 3 nurses, one being a midwife and the other 2 medical assistants and a biologist for the laboratory. It was during the gap between missions 18 and 19 that the dentistry equipment was installed on board. It was totally funded by donations received from members of the YPO/WPO organisation (Young President’s Organisation/World President’s Organisation) following the conference for presenting the projects carried out by your given organisation, by their invitation, during a dinner for the members in the gardens of a large hotel in Rangoun on the 1st March last year. I would like to thank them once more on your behalf. The chair and compressor came from China, the turbines and tools from Japan, India and Pakistan. 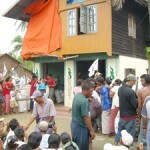 Since the first stop, the villagers have been happy to be able to have access to this new healthcare. In two missions 287 adult and child patients have benefitted from dental care. At the start of the academic year, the 1st June last year, the orphans returned to learn in the heart of the monastery. 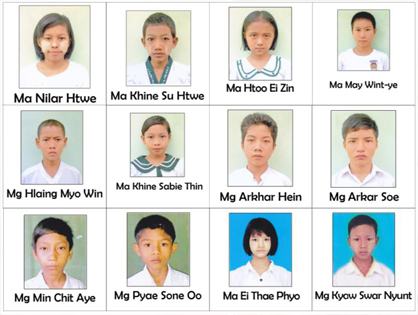 12 of you chose to sponsor an orphan for one academic year. Here they are. 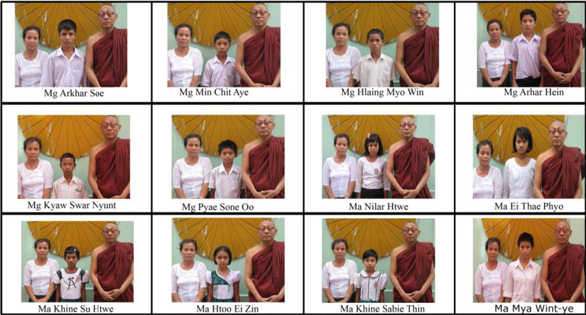 The monk in charge of managing the school chose these children to benefit from your support. We gave all of your donations to him. The day before the children went back to school, the mothers of the host families accompanying the children came to the monastery to receive a third of your donations in front of the monk. The rest will be given to them at the beginning of the next two terms. At the start of the year Mr Gressner renewed the support from the organisation STIFTUNGLIFE that he chairs, which has provided unfailing support since the launch of the ‘Swimming Doctors’ project in 2009. We have also received during this semester slings made in France by THUASNE. During the 2nd semester, we received Nocospray sprays, also made in France, which will allow us to sterilise the operating room and the dental surgery every evening. They were given to us by the company LEITMOTIV from Hong Kong where the managers, members of our organisation, were in Myanmar during the inauguration of the school which was built last year. To each and every one of you I offer my sincere thanks, as it is thanks to your support and their support that Zawgyi Care and Swimming Doctors will be able to continue to work successfully, upholding the reason why our organisation was created. To support our charitable projects please address your donations accompanied by the form below. Here we are, already in the early days of 2012. It is about time that I tell you about the action taken by your organization during the second half of 2011, which has passed by so quickly. As in the first half of the year, they were focused on two principal areas: the running of our boat clinic “Swimming Doctors”. As in the first half of the year, they were focused on two principal areas: the running of our boat clinic “Swimming Doctors”. The end of the renovation works and of the extension of the school to accommodate 2500 children, located in North Okkalapa, one of the poorer areas in the north of Rangoun, which was opened in great style on 11th December 2011. Since the launch of our first « Swimming Doctors » boat, 14 missions have been carried out. They have allowed 8,224 people to be treated, on average 587 patients per mission, so 30 patients per day. These figures confirm those given in the previous report. Although on the boat we have gone as close as possible to the villages, sometimes the medical team has to go to the most isolated villages to treat the sick gathered in a monastery like we did in 2008, after cyclone Nargis. 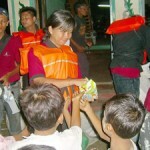 Several children were born on board, some of which are most definitely from a whole different generation to their mothers, given that they were delivered feet first and born by caeserean section performed on board. It is a Burmese tradition that it is the monk of the village who should name the child. 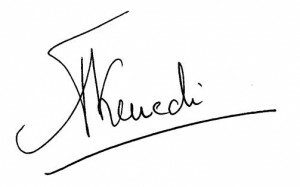 Children are often given one of their parents’ names, and the concept of a surname doesn’t exist. Here’s a funny story: children who are born on board often are given “Zawgyi” as one of their names. Similarly, the little girl above, born on 18th October, is called Zawgyi Aye, while in another village, a boy was given the name of Zawgyi Tun Aung etc. Now with hindsight, I have started to put together the pathology statistics from the people from the delta region there is suffering most often. To my great surprise in one year we have not had to treat one single case of malaria just as we have had to treat “exotic” diseases. We have only diagnosed 3 people as HIV positive and they are now undergoing triple-drug therapy. Besides seasonal diseases which are the same as those in Europe and accidents at home and in the workplace, it seems that there are only 3 big epidemics: hypertension, ENT and digestion diseases and alcoholism. There is a fourth, but seeing as we cannot relieve crises if they happen at the time of our trip, it is diabetes. If we can obtain triple-drug therapy from a NGO specializing in AIDs treatment, for those who are ill in our village it will be possible for us to provide treatment for life for the sick suffering from diabetes which is genetic or due to their age. Hypertension is due in large part to the consumption of too much salt and of “Gna pi” sauce which they use in everything. Taken from dried fish and therefore containing lots of salt, and with lots of pepper added to it, the strong taste created by this sauce masks that of dishes cooked with staple foods that are not always fresh. 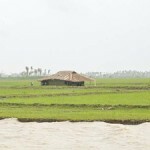 Fridges are rarely found in the bamboo huts built in the middle of paddy fields. The ENT and digestion illnesses are due to the betel quid which both men and women alike consume in large quantities. The quid is made of a leaf and pieces of betel nut to which spices are added, some liquorice wood shavings and small pieces of tobacco leaves. To digest the juice obtained by chewing, the betel leaf is coated in a layer of lime. The mix wreaks havoc with the mouth which very quickly becomes toothless and also in the digestive system. Abusive consumption of spices also surely increases these pathologies. Alcohol abuse. As in most countries, there are two types of alcoholism, that which is almost incurable as addiction is so strong, and that which you can treat. The consequence of these passing excesses are often linked to the monotony of life as there is not a lot to do once the rice has been planted, harvested and the paddy fields ploughed. With regards to childhood illnesses, there is nothing in particular to inform you about. Children suffer from the same illnesses as us, but the systematic vaccinations are not given, even against Tuberculosis, cases of which are becoming widespread. The BCG vaccination as we know it in Europe, is not active here. As soon as we diagnose a case of Tuberculosis, we make sure that the patient is transferred to a specialized centre run by of the Department of Health in Rangoung, where they are provided with free treatment and recovery, in order to ensure straight away that they are not contagious if it is an open form of the illness. The treatment lasts several months. There is one last thing that seems interesting to point out, which are the vitamin and nutritional deficiencies that we encounter. They are often not linked to a lack of food, but to a monotonous nutritional pattern from always eating the same foods, which are often low in protein. When we analyze these preliminary disease statistics of inhabitants of the Irrawaddy Delta region where we pass, it appears that they are often linked to lifestyle, behaviour and when they secure work for the whole season or not, according to when it rains such as during monsoon, or when the climate is dry like in winter when the temperatures are mild for this latitude (between 18 and 30 degrees) and in summer when it is very hot (between 25 and 45 degrees). It is about time that I also give you some news on your boat, on the crew and on the medical team. For the boat, we did not have to face new problems with the structure. 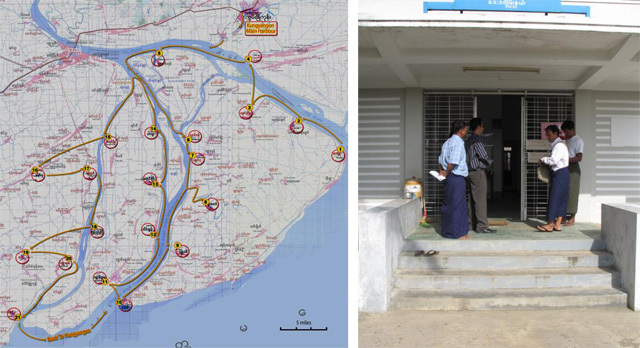 Its monthly maintenance in Rangoon allowed us to repair its problems with navigation which regularly appear. 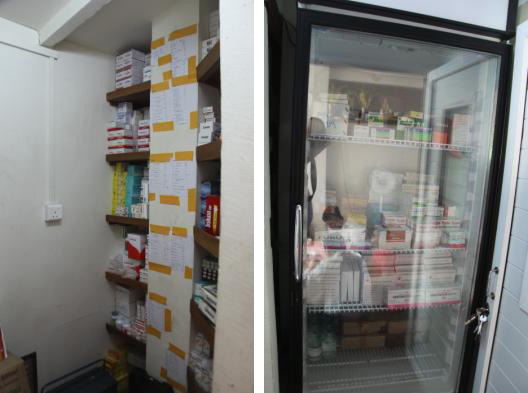 During its 2 week break for its full check in October, we took the opportunity to change the location of the central pharmacy and the laboratory, so that it is no longer joined to the treatment room, where they carry out deliveries and operations. For the crew, no significant changes, other than the arrival of a new cook/mechanic. For the medical team, it has become stronger with another nurse/operating nurse. Thanks to your donations we have been able to buy a monitoring device which is much needed for operations done under epidural. 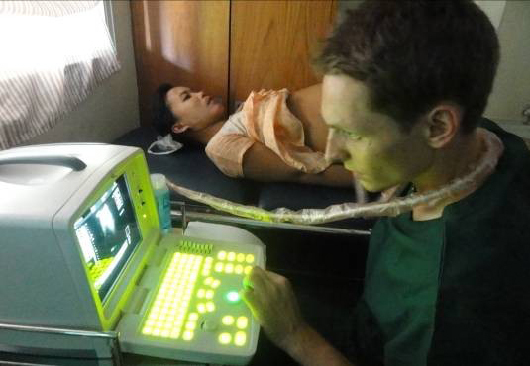 Since October and until the end of February we have a German doctor on board who specializes in ultrasound which improves the training of our doctor and two of our nurses. The solidarity of the village people is notorious. Just when it is necessary for one of them to have a blood transfusion, we immediately find a donor to obtain one or even several units of blood. After the necessary checks have been carried out by our laboratory technician, the collected blood is transfused. The distribution of reading glasses donated by the STIFUNGLIFE association has also been very well received. It is amazing to see the immediate satisfaction it provides to those who, without this accessory, cannot see up close. 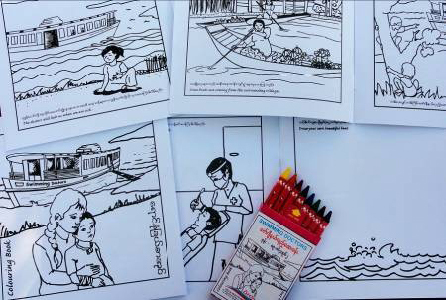 For our mission number 15, starting on 8th January, colouring books were sent, also donated by the association STIFUNGLIFE, for children who come on board either for treatment or to accompany their parents. 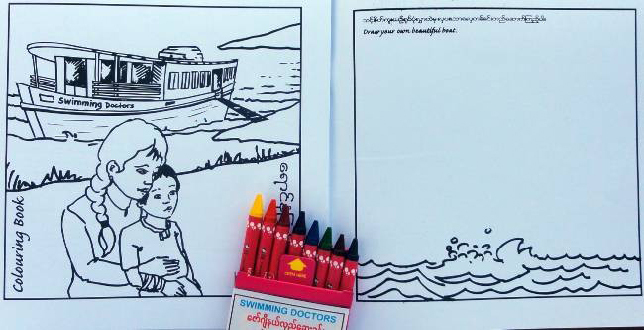 With a circulation of 10,000 copies, this 12-page book illustrates what the “SWIMMING DOCTORS” trips bring to the villages and the phone number of the boat. It is handed over to the children with a box of 8 coloured crayons. One page is left almost blank so that they can draw their own boat. During the last months of 2012 these pages will be gathered up and presented to a panel of artists from the Fine Arts Academy in Myanmar. The three best drawings will allow these children’s villages to receive financial help in order to construct or renovate something or some shared equipment. The first semester already started for 10 days, promises to be good, since, thanks to your donations, it will allow us to continue to bring medical help and treatment to people in the remote villages of the delta that the Swimming Doctors provide. 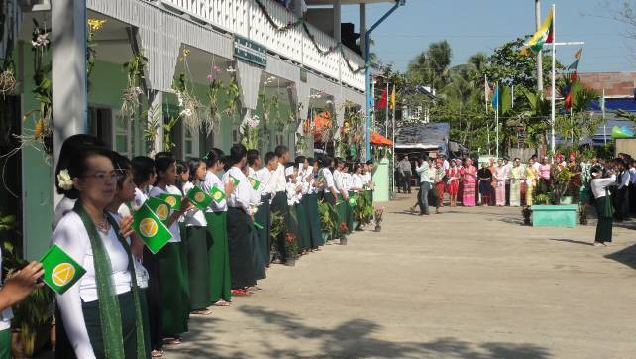 It was on 11th December last year that the ribbon was cut for the inauguration by the Director of Education for the Irrawaddy division and balloons flew in the skies or North Okkalapa. An extremely colourful, loud ceremony, with songs and traditional dances – in a word : very happy. Teachers and students were spread outside and throughout the school. 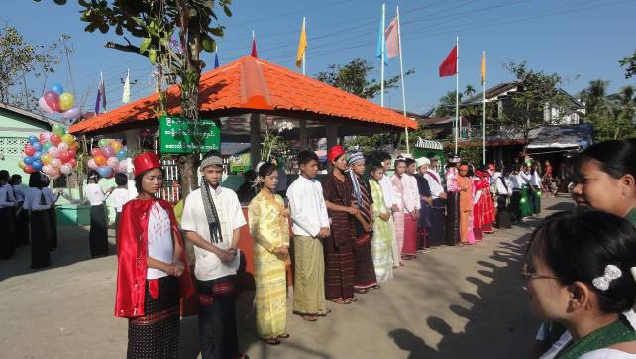 A double guard of honour was formed by the students and by teachers, wearing the local costume of the principal ethnic groups of Myanmar as it is still possible to see them in the countryside on market days and holidays. It was then time for the thank you speech. 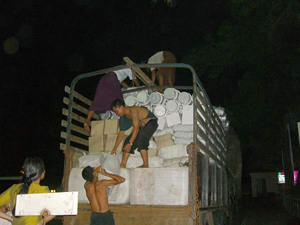 Phyo, the representative of our association, could not escape. Then came the graduation to celebrate the event. 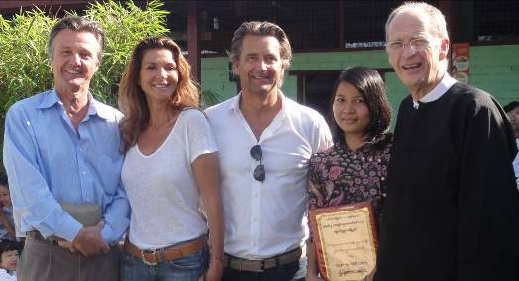 Your association received a diploma which was given to Phyo. As a photo is worth more than a thousand words, here is the same classroom before and after in one of the renovated buildings. The entirety of the works, whether they were for the renovation of the 2 side buildings, the construction of the central building or the height extension of the whole plot, , with the view of being out of the water during the rainy season, was finished for €80,230, a cost-overrun of €230 compared to the initial cost estimate. During the works, Anne Marie, your Treasurer, came on site and the Director of the School gave her a tour. Mr Gessner, the President of the STIFUNGLIFE association, which has supported and financed this project that we have worked on, also came on a number of occasions to see the work in progress. Also from Hong Kong was the d’Auriol family, who are members of our association. Coincidentally they were present at the time of the inauguration. A big thank you to those of you who have sponsored a boy or girl and sometimes even two. As the school year was well underway, I preferred to choose children only for school year 2012/2013 starting next June.I thought that we had already done alot, directly and indirectly, for this school since it was your organization that financed the furnishing of these new classrooms, so I decided that your donations will help children in a school for orphans run by monks, situated in a monastery in the heart of Rangoun. This school is much too small for the 150 pupils that study there. Those who teach are sometimes monks or teachers provided by the public education sector. Building a new building is one of the other objectives of our association for this new year. For those of you who would like to sponsor a child, you can just send us a donation, with the amount listed below, specifying whether you would like the recipient to be a boy or a girl. Tuition fees per child are €15 a month, or €150 for one school year. Anne Marie, Nicolas and I would like you to accept and share with your nearest and dearest our very best wishes for 2012. We would like to thank you in advance for your gifts, which will allow us to continue our actions throughout the year. We are already in the last days of June and so the time has come to tell you about the action taken by your association during the first semester of 2011 that has just come to an end. 2 – The renovation and expansion of a school of 2500 children located in North Okkalapa, one of the deprived areas of Rangoun. The first mission of the year began on January 4th, aiming to be finished by the 24th. We had at that point only one doctor on board, the second having left for further study in Malaysia. 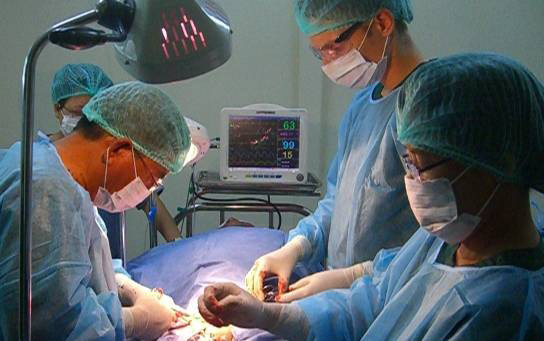 We treated 726 patients, 29 of which were cared for free of charge, an average of 37 people a day. 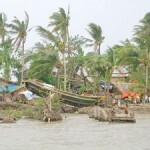 The patients made it on board either from the shore or by boat if they were travelling from a neighbouring village. I won’t bore you with all the detailed numbers and statistics of each mission but bear in mind that since January 4th right up until the day of writing this current newsletter which comes in the middle of our eighth Mission which departed on June 17th, 4030 people have been treated in total, or an average of 30 patients each day. Thanks to the almost daily little interventions carried out on board, from stitching cuts to plastering broken bones, the everyday accidents that occur in the populations of the villages around the delta don’t have the serious consequences that they would probably have otherwise. The medicine is distributed by one of our nurses and only the correct dosage, in pill form, is prescribed. The laboratory has also played an important role. 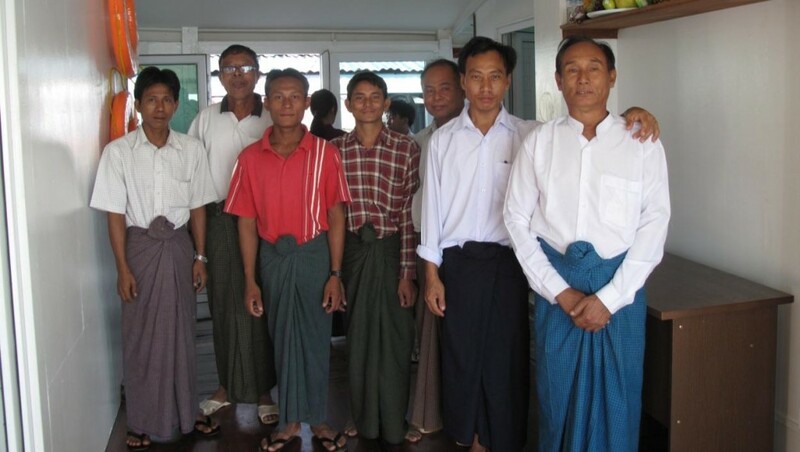 In almost every mission we have identified patients suffering with Tuberculosis, patients who are HIV positive and cases of Hepatitis B and C.
We send those diagnosed with TB to the Myanmar Rangoun public health services who treat the illness free of charge. We send those who are HIV positive to specialist NGO units which benefit from international public donations to treat this illness, distributing free triple drug therapies. For hepatics, in addition to the available treatments, the team give educational classes on the importance of their behaviour in order to not pass on the illness to their loved ones and sexual partners. The social calendar this semester has been full to the brim. We also had aboard the Director of research at Laboratoires Roche (on the left in the photo), accompanied by her sister who works as a producer for the main public television channel in Germany. Adopted immediately by the children, they lived on board for two days to the steady rhythm of the Swimming Doctors. 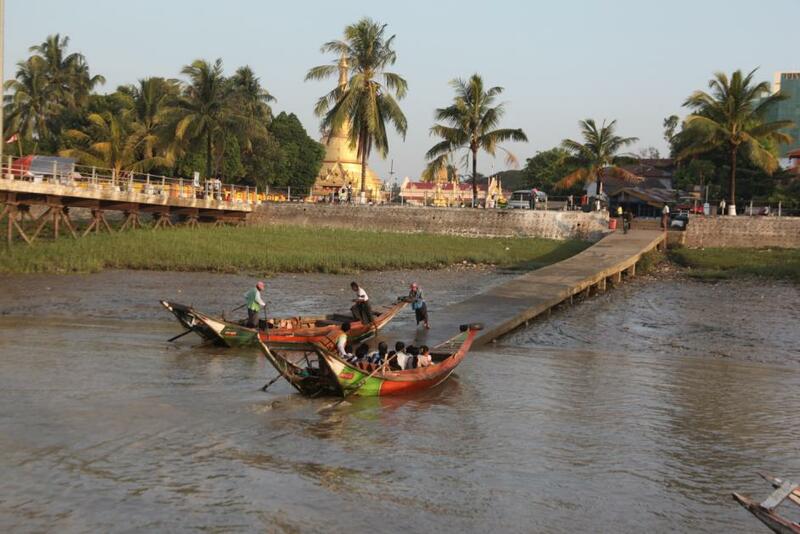 They also learnt about the lives of two villages in the Irrawaddy delta. Another surprising occurrence this semester –although a much less pleasant one- was the appearance of a major structural problem in the hull which meant we had to stop for a month, from the 23rd of March to the 22nd of April, and return to the shipyard. We had to strengthen the entire hull, make the mainstays more rigid and recommence our efforts to check the latticed metal girders along the ship. An expenditure that was as unforeseen as it was expensive but which couldn’t be put off any longer if we were to ensure the ease and safety of future missions. During this stop we found and hired a young female doctor of 27, who had been working for two years for a denominational charity. As the boat was out of action, we put to good use this wasted time to send our latest recruit on a training course in order to learn how to properly use the on board ultrasound scanner. She was trained by the Director of Radiology at a clinic in Rangoun which had the same equipment as us. 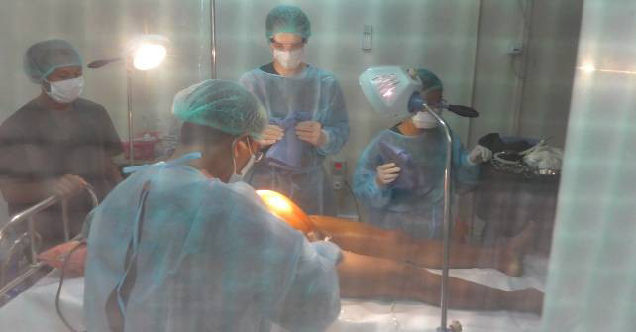 Our Burmese patients, like undoubtedly those from many other nationalities, prefer to have a woman conduct this procedure. So that the medical team can be independent of all external help when going to care for people in villages that are inaccessible by river, we bought a smaller boat. 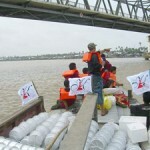 These pictures were taken during the most recent journey of the boat to Rangoun. It will interest you to know that during missions 6, 7 and 8 which took place during the rainy season we had half the daily number of patients. 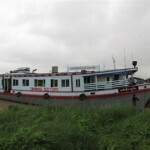 There are two reasons for this : one is that people travelling for a consultation by boat are often fearful of the weather conditions which make the use of their small and fragile boats in the delta very dangerous, the other for financial reasons despite the smallness of contribution we ask for. 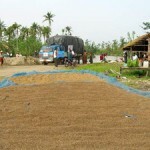 The rice farmers are between two harvests, stockpiles are low and it is almost the time to gather in before next November. This explains why the cases treated during the harvest season are often much more serious than in the dry season, and also why we see less children. Contrary to what I thought before, if we stick to the time-schedule of our missions thus far we won’t be able to stop at all the villages that we initially thought. Moreover, we have used the experiences of our first missions to adapt to the needs of the rhythm of the journeys. We stay two days and sometimes three in each village to allow the sick from neighbouring villages to come for an appointment. The very positive point to make is that the structure of our missions has been spread, and it is known that we always travel within the same stretches of the Irrawaddy, that the cycle of our missions is now fully integrated into the heart of the populations and families daily call at the boat to find out either when we next return or to ask which villages we stop at closest to where they live. During the second semester we will add to the already provided treatments and interventions the distribution of reading glasses generously offered by the organisation STIFUNGLIFE. The average expenditure per patient funded by your organisation is 7 euros. This includes: the wages for the medical team and the ship crew, as well as the total cost of running and maintaining the boat not including major repairs and the fairing, which must be carried out twice a year. From next July to December, Swimming Doctors will undertake 6 missions of 22 days in length each and spend 3 weeks in the ship’s yard for fairing. It should provide medical assistance to more than 4000 new patients. 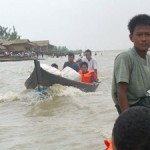 All these figures give you a much clearer idea of the financial needs of your organisation so that it can continue to promise help to the populations of the villages around the Irrawaddy Delta. I now want to talk to you a little about how we came to invest also in the renovation and expansion of a school of 2500 children situated in North Okkalapa, one of the deprived regions of Rangoun. Two years ago, Phyo Phyo Wai, who had worked for 12 years as a maid with the family of one of the partners of Zawgyi House. 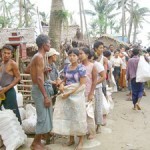 Having household staff is normal in Burma even in poorer families. As her relationship with the mother of the family was difficult, my partner suggested to me that we hire her instead, give her an education and maybe the chance to do something more with her life than being a servant. I agreed on the condition that she go back to school to finish her studies that she’d abandoned too early, hoping that perhaps she could continue with university study if her results were good. As her family didn’t live in Rangoun, we had to find a school that would accept her. It was thanks to the sister of one of our dressmakers who is a teacher in School Number 7 in North Okkalapa that she was given a place, but in the same class that she had been in before stopping school, therefore at the disadvantage of being two years behind her classmates, although with the advantage of being more mature. Last December, the annual school prizegiving ceremony took place to give prizes for the previous academic year ending in April 2010. As Phyo Phyo was a winner, I went with Phyo and the dressmaker to receive the award. All the prizes having been distributed, the school headteacher made a speech during which she discussed the appalling conditions in which the children had to work. 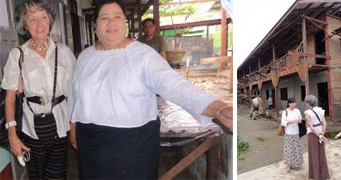 Leaky ceilings, damaged premises, a playground flooded in the rainy season etc. 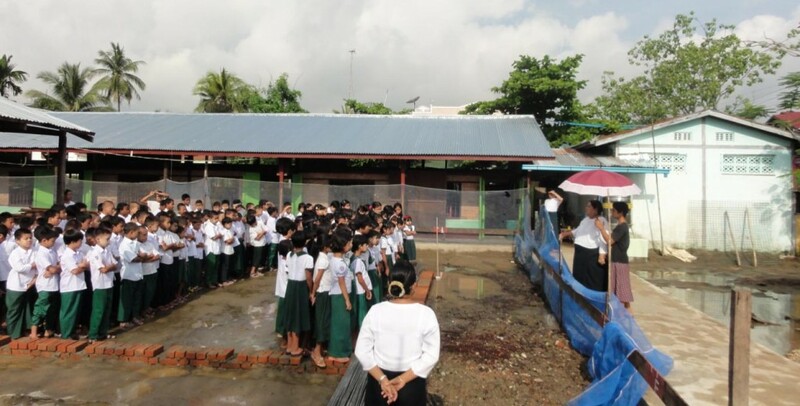 Such conditions are further aggravated by the ongoing construction of the last two years of four concrete roads surrounding the boundaries of the school. These roads are 30cm higher than the ground level of the school. The result is that in the rainy season the classrooms are flooded to such an extent that the children must bring in a bench. Whilst sat behind their desks they rest their feet on the benches so as not to have them in the water during lessons. This appeal to the generosity of the residents of the disadvantaged local area is a blot on the otherwise celebratory atmosphere of the ceremony and the inspection of the premises which followed convinced me that we should try to do something to help. 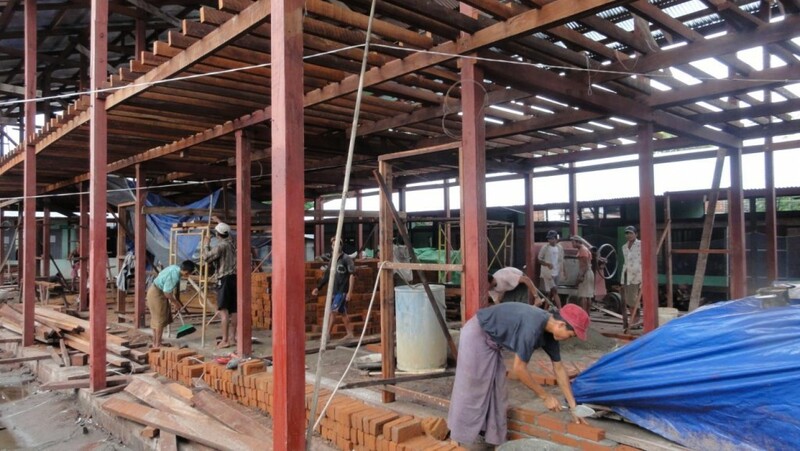 At the beginning of January I contacted Mr. Gessner, the president of the German organization STIFUNGLIFE which runs a programme of renovation and construction of schools in Myanmar, to propose the project. 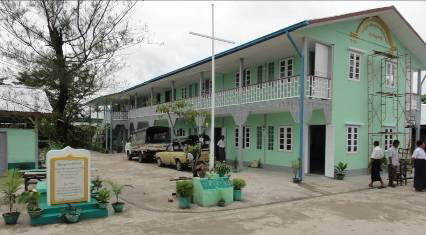 The schools that the organization funds are all located in the rural region of Pagan. The chance to participate in the renovation of a school situated in the Rangoun suburbs quickly gained his interest as with no time to spare I went ahead making appeals for donations. By the second fortnight of February, Mr. Gessner was in Rangoun. He was able to visit the school with an estimation of the costs in his head. Works to raise the classrooms and the surrounding link roads, structural and roofing repair as well as changing the entire roof in three of the buildings comes to about 15 000 euros. A sum that we allocated to STIFUNGLIFE to realise the project. On the last day of the school year which runs from June 1st until February 28th for secondary schools, we were ready. By the time we had obtained the necessary authorisations from the academy and the town, the work began on March 18th. Since our work began, we have been able to benefit from giving the classrooms more daylight, altering the access traffic and improving many details which make the life of both the students and the teachers more comfortable, even if the term may seem to some of you a little exaggerated. From April 30th, the first classes will be refurnished. Two weeks before their return to school, when the teachers had begun work again, everything was completed. These two ‘Before’ and ‘After’ pictures say more than a lengthy description could. Throughout all the work, I had numerous meetings with the headteacher of the school, who lives on site. We talked about the difficulty that she had providing quality teaching whilst being obliged to split the classes up due to a lack of space, dividing up students and teachers into two teams one in the morning and one in the afternoon. Furthermore, as the population of the area is rapidly growing, many classes had too many pupils, and it was becoming a real problem. The solution would be to have new classrooms. The available ground space would allow the creation of a new two storey building, which would create 8 new classrooms. With the entrepreneur, we got back on our computers and soon the first plans were made. We quickly agreed on the design of a simple building, in wood, iron and brick. Once again I started appealing for donations without knowing if I would find funding for the project. In the first days of April, during the stay of Mr. Gessner and after his visit of the almost finished building site, he agreed to finance the raising of the ground to keep students and teachers out of the water in all seasons. In the exchange of emails that followed, I put forward to him the reasoning behind the project for the new building. Plans, raisings, estimates and completion dates followed. 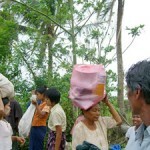 Cost of the operation : 66 200 euros during Kyats on April 25th. Convinced as to the importance of the extension as he was, as with the that of the repair works and the raising of the classrooms of the existing buildings as well as the entire surrounding ground so that the entire school was out of water, he asked me for time, time to study and present the project in Germany, time to present it to the STIFUNGLIFE office. On May 2nd he confirmed an agreement for the funding of the new building. On May 20th, planning permission was granted by the urban community of Rangoun and by the Minister of Education. On May 24th, one week before lessons started again, we conducted the ceremony of marking the new foundations of the new building. Why Tuesday rather than Monday, you might ask? Because Monday is considered, in popular Burmese superstition, to be an unlucky day, nothing new begins on Mondays in Myanmar. 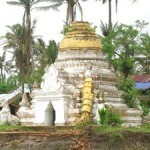 …and offerings to the spirits of fresh coconut, bananas, lucky leaves, sticks of burning incense, plans of the construction site slipped into the midst , and giving prayers to Buddha from the whole company. Then we had to sprinkle the perimeters of the construction site with a mixture of water and Tanaka, using the lucky leaf. Then came the fun part for the workers on the site. They threw grains of puffed rice in to the air, to which were tied 100, 200, 500 and 1000 kyat notes. It soon became a free-for-all ! On June 1st, the pupils returned to a playground still under construction, but to a fully renovated premises, to the great surprise of students and families. Once the bricklayers and carpenters have taken possession of the playground, the construction of the new building will begin. The new classrooms should be ready by the middle of October, for the start of the 2nd school trimester which happens after the holidays for the festival of light. As of this June 30th, the new building has a roof. The builders start work on the walls. We are launching in the second semester a new initiative: Sponsorship. 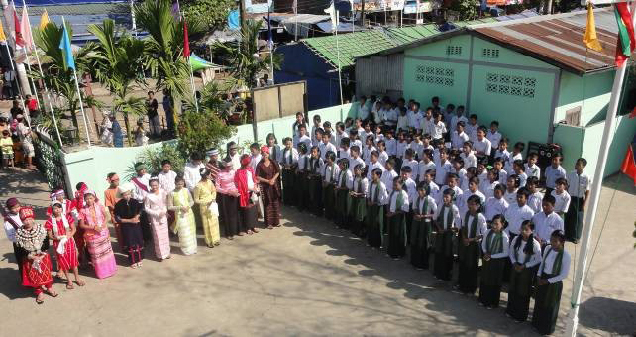 If in Myanmar education was free, the families would only have to provide their children with textbooks and stationary so that they could continue their lessons. The cost per student is about 15 euros a month, or 150 euros for a school year. For those amongst you who would like to sponsor a child, we only ask for a donation of this amount, specifying whether you would rather sponsor a boy or a girl. Along with the headteacher of the school, we would choose the student to benefit from the donation. We would let you know who they were, send a photo and some information on their curriculum and their family. Anne Marie, Nicolas and I will write back to you in 6 months to relate the facts and figures of our actions in the 2nd trimester, which I have no doubt will be rich with news. We thank you in advance for any donations, and want to express our gratitude for all that they allow us to do. This year, now coming to a close, has been almost entirely dedicated to our mobile boat clinic, with the exception of three initiatives. 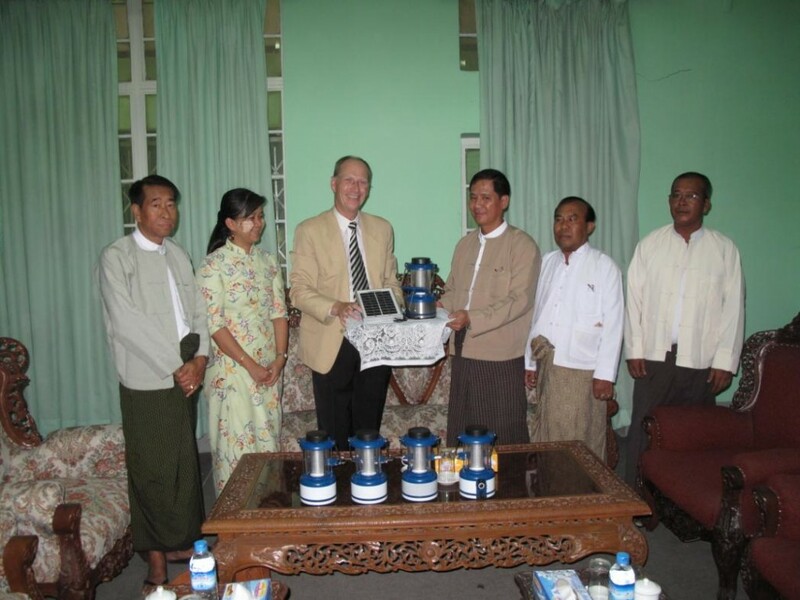 The first, at the end of June, was to present the minister for Social Services with 1000 solar powered lamps to be distributed in villages in North West Chin and in the centre of Kaya, these areas having not received any aid after Cyclone Nargis. These Chinese-imported lamps can run independently for 12 hours. With the help of the solar panel that is provided with each lamp, they can be recharged in 6 hours. The batteries have an estimated lifespan of 5 years. Once the batteries have stopped working, we will replace them with new ones so that they aren’t thrown away, which would damage the local environment. 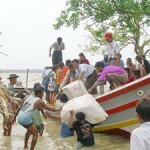 The second, on July 12th, was to give the same minister the sum of 5 580 250 Kyats (5580 USD), as he had asked for help in providing benches, tables and other academic materials to a school of 45 children who were orphaned following the devastation caused by Nargis when it passed through Labutta. 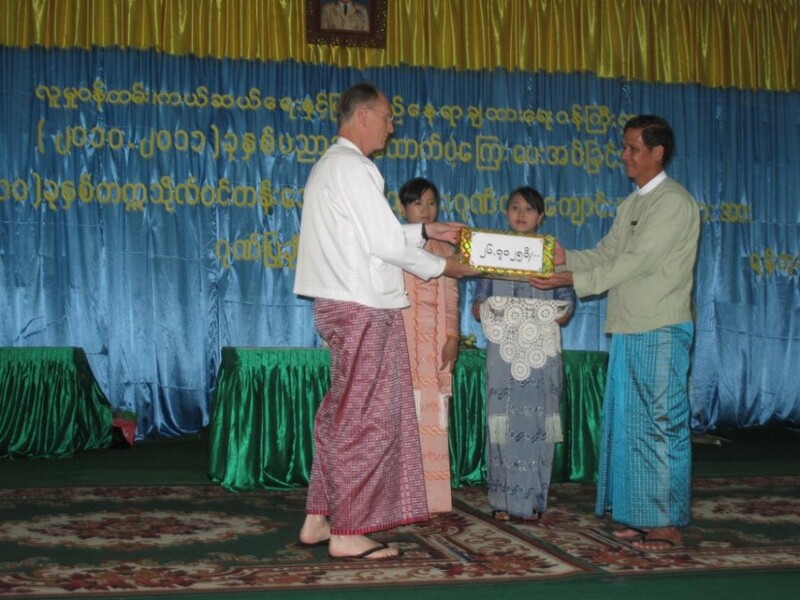 The third consisted of presenting the sum of 2 500 000 Kyats (2 500 USD) to the family of U Myint Thein. In 2008, this man was then the Director of the minister of Social Services. 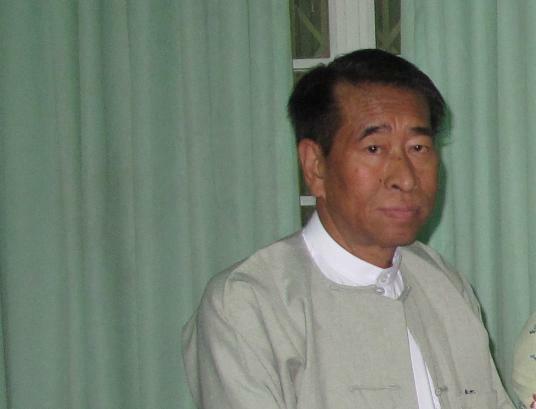 It’s thanks to him, and to the confidence that he had in us, that we obtained the necessary ‘rights of passage’ that enabled all our actions in the delta after Cyclone Nargis at a time when the delta was only accessible to a scarce few non-Burmese humanitarian organizations. By contributing to the cost of his kidney transplant, this sum, added to the donations given by his family and friends, has saved his life. 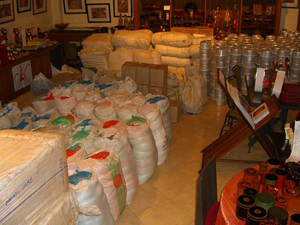 The intervention in New Delhi has been carried out for a total cost of 25 000 USD. These three actions did not take up much time, which was not the case with the restoration, transformation and kitting out of the boat clinic. It was only on last October 13th that, after 9 months of work, it left the dockings where these had been carried out. The two pictures which follow are more eloquent than a long a description. The day of she left the construction site on October 13th 2010. Inside the boat you find the engine, the tank of diesel oil supplies as well as the 2 generators, the laundry room, the dormitory of 6 bunks for the 8 members of the team (as there will always be 2 people on nightwatch). The station for water treatment. 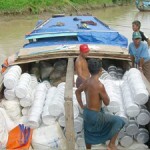 To be totally independent, the boat draws water from the river. 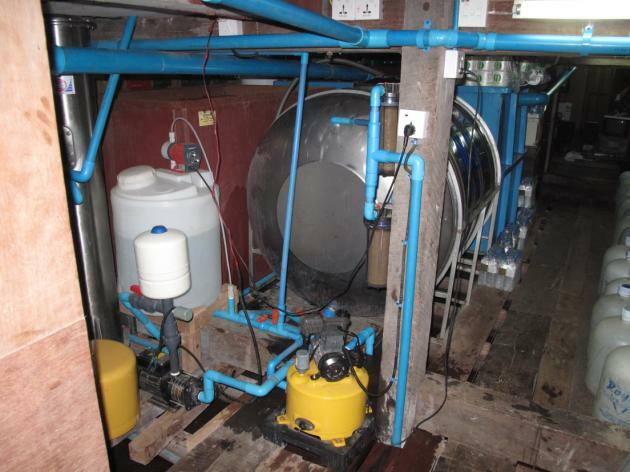 This water is filtered and purified on board, then distributed both hot and cold on the main deck. Because the water treated on board has a strong chlorine taste which makes it rather unpleasant to drink, 60 cylinders containing 20 litres of drinking water are taken on board at the start of each mission. The four cabins ( 10 bunks) for the medical personnel, whose number is currently 7. 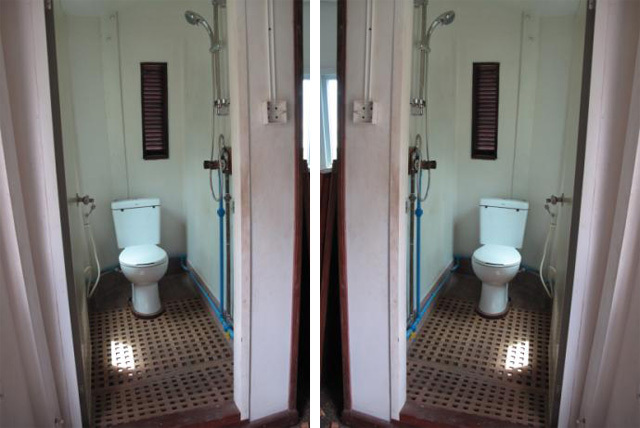 And the two toilet and shower rooms. 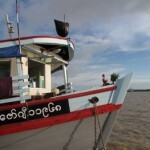 To keep the authorities and local officials of the 21 villages chosen as anchoring points for each mission, the boat, with the medical team and Khin May Pyho Win as reinforcement, departed on an initial tour from last October 30th to November 4th. The response has been very positive as if the arrival of our boat clinic corresponded with their expectations in terms of medical assistance. On the return to Rangoun, a final technical visit was made. On November 8th, the boat will depart on another tour under actual operating conditions. Everywhere we’ve travelled, we’ve received enthusiastic welcomes from the patients. Each time, they’ve formed an orderly queue and waited patiently for their turn. 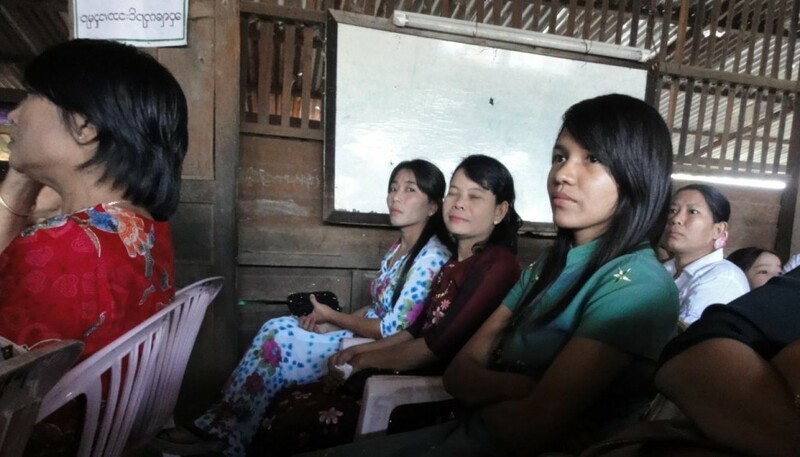 Our initial set prices were 1500 Kyats or 01.30USD per visit and 1000Kyats or 0.90USD for laboratory testing, but these have turned out to be on occasion too high, because we have entered into direct competition with nurses and midwives who in certain villages take on the role of a doctor. From time to time, the doctor and a nurse have to go directly to the bedside of patients who are unable to come to the boat. As on board we sell medicine at cost-price, the director of the boat had to, at my behest, talk to the medical team to ensure that prescriptions were only given sparingly, in order not to create a market in resold prescription medicine in the villages we visited. Similarly, we had to quickly take to heart the following rule: “No go ahead from one of our doctors, no medicine given”. During this shorter mission, 492 sick were cared for in 17 days, or an average of 28 patients a day, which with only one doctor on board is completely within our targets. Because the date for the baptism of the boat was set by a venerable monk for the 4th of December, the tour only visited 16 of the 21 villages. 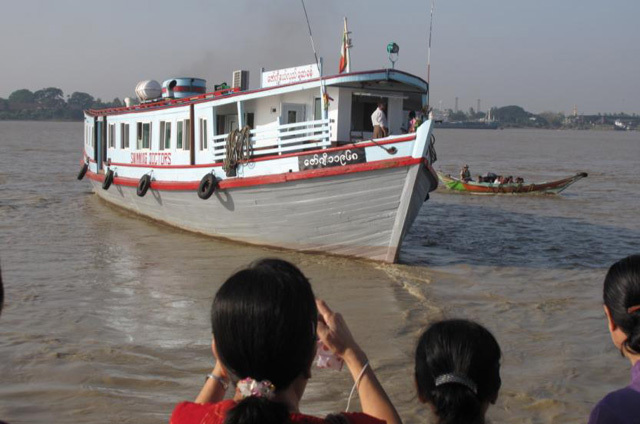 The boat returned to the pontoon of the port of the Botataung Pagoda, located in the centre of Rangoun. 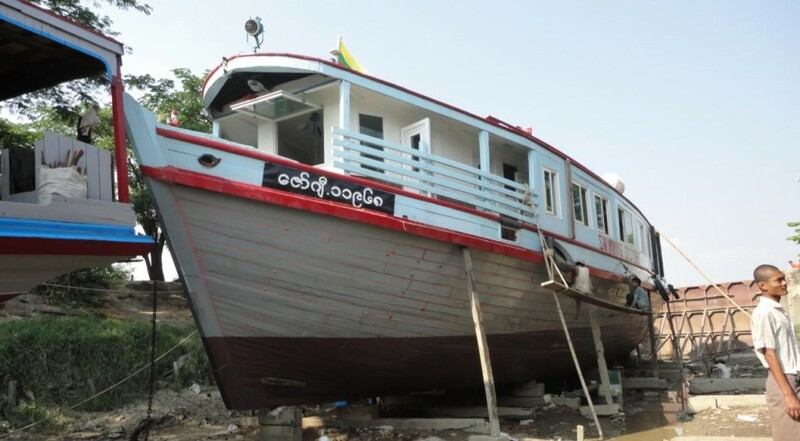 December 4th, the day we’d all been waiting for so that the boat could be properly inaugurated into the Burmese spirit, finally came around. The day before, we got busy in the kitchens to prepare the snacks for the order of monks. By 5am, lots of the people working for Zawgyi House were already on board garnishing the platters of fruits, cakes, ices and other drinks and delicacies for after the monk’s ceremony. Half an hour later they arrived. The officiating monks always arrive at 5. Why at 5 you may wonder? Because the first, the holy monk who speaks and preaches, is an incarnation of Buddha. The four others represent: Buddha’s speech, the collectivity of monks, masters and parents. Before officiating they begin always by worshipping an image of Buddha, one of which we have on board beneath the registration office. Then they turn towards the audience and the ceremony begins. Mr. Jürgen Gessner, President of the organisation STIFTUNGLIFE which has greatly helped with the funding of the boat, prays devoutly as does Daw Khin Hla Cho who advised us when choosing stock for the pharmacy, and for other medical materials. Although it was very early, the German ambassador and his guests joined with the meditation. 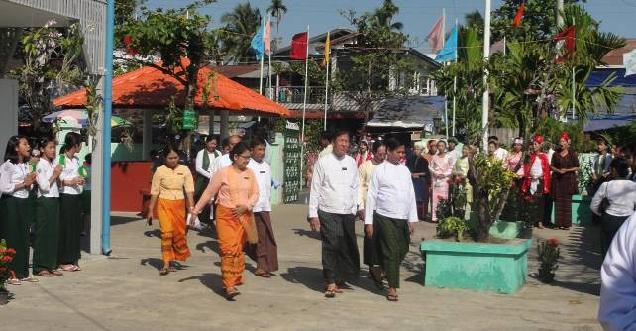 Once the ceremony was finished, a huge breakfast was served to the monks under the watchful eyes of Phyo. This done, they returned to their monastery where, like all monks and nuns in Burma, they take their second and final meal of the day before midday. Then it was the turn of the guests, builders, technicians and labourers who worked on the modifications and construction of the boat to share the same meal. The tables were quickly laid. The agreed hour of departure grew closer and it was time to take the final photos, including one of the crew with the Captain on the far right and next to him, with his arm around his shoulder, the manager who represents us on board. 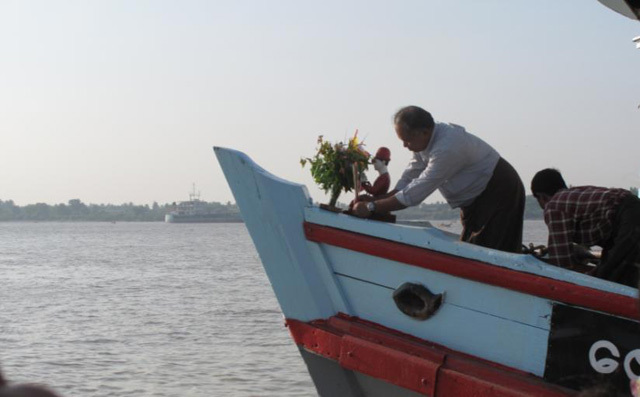 To encourage good sailing conditions, the First Mate laid garlands of flowers on the statue of Zawgyi then placed it at the stern of the ship, surrounded by burning incense. The moorings are cast away. The nurses give us a final smile. 2012 has been a busy year. Thanks to your support, we have been able to make our dream of having a boat clinic operating in the Irrawaddy delta, a reality. Anne Marie, Nicolas and I will give you another update in 6 months to relate to you the results of the missions of the first semester of 2011 which I have no doubt will be full of news. 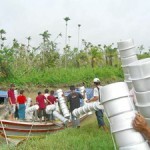 We thank you in advance for your donations, and want to express our gratitude for all that they have enabled us to do. Total = 664 familles x 4 personne en moyenne par famille = 2.656 personnes. L’ensachage de l’aide alimentaire fini, les moustiquaires et couvertures sont reçues. Notre base est pleine. Tout est prêt pour notre depart prévu a 4 heures du matin. La lune est déjà haute lorsque nous montons à bord des deux barques de pécheurs qui nous ramènent au pont de Dedaye où le camion nous attend depuis 9 heures du matin. Trois heures plus tard après être tombé en panne d’essence pour cause de réservoir trop petit pour la distance (une bouteille d’eau en plastique d’un litre) nous le retrouvons et après encore trois heures de route dont je vous fais la grâce de ne pas vous narrer les ecchymoses qui en résultent, nous finissons cette journée commencée 23 heures plus tôt. Depuis la mi-journée tout est ensaché, entreposé dans l’espace qui nous sert habituellement de restaurant. Comme nous devons partir bien avant que le jour se lève nous chargeons le camion après la fermeture. C’est la première fois que nos destinataires sont aussi nombreux. Tout ne rentre pas. Pas question de prendre un camion plus gros il ne passerait pas tant la route est mauvaise. Comme il n’y a ni tunnel ni pont sur notre route, la solution est de charger en hauteur au-delà des ridelles et de maintenir solidement le tout par la bâche. Il reste si peu d’espace que 4 d’entre nous devront faire le voyage sur le panneau du hayon arrière ouvert. Après une très courte nuit, nous passons prendre l’infirmière et les 2 docteurs. Route pour Dedaye. La chance nous sourit il ne pleut pas. A l’heure où les enfants rejoignent leurs écoles nous devons nous arrêter pour récupérer quelques fait-tout tombés après une violente embardée. Au pied du pont de Dedaye nous trouvons le bateau, le chef de village, les fermiers et les pécheurs qui sont venus nous aider à transborder le chargement. A coté de l’endroit où nous nous sommes arrêtés, sèchent sur des bâches des semences de riz sauvées. 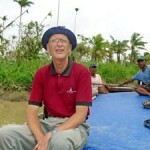 Début d’une longue croisière vers Tande et les autres villages, objets de notre mission. Navigation plaisante même si le temps se couvre. Sur les rives, les blessures des pagodes ponctuent le paysage qui, plus nous avançons vers la mer, devient plat. Comme toujours tout est immense. La rivière Dedaye que nous descendons ne cesse de s’élargir pour atteindre plusieurs kilomètres. Plus nous avançons plus le vent se lève, plus le clapot s’intensifie. Dans cette immensité de rizières ce qui surprend c’est la hauteur très réduite des rives, quelques dizaines de centimètres séparant les espaces cultivés de l’eau de la rivière. Sous l’effet du cyclone le niveau de tous les cours d’eaux du delta s’est élevé de plus d’un mètre parfois beaucoup plus, tout était submergé par ce raz de marée que rien ne pouvait arrêter. Le moteur est pris de hoquets qui nous sortent de cet état contemplatif. C’est la panne. Malgré les tentatives et les efforts du mécanicien c’est la panne totale, irréparable avec les moyens du bord. Nous dérivons. Très vite, deux bateaux nous portent assistance et nous prennent en remorque. Au bout d’une demie heure, le plus gros qui s’est mis à couple doit nous laisser. Nous ne sommes plus remorqués que par une barque de pécheur qui sans l’aide du courant ne nous déplacerait pas d’un mètre. Les heures passent, un grain aussi, il faut rapidement fermer les panneaux de cale. Au loin passe un ferry qui fait la liaison entre les villages et Dedaye. Il fait route aval. Grands signes, il se détourne, récupère le chef de village qui part chercher à Tande des bateaux pour nous tracter à bon port. C’est tiré par un attelage de 3 barques de pécheurs qu’enfin au bout de 6 heures nous voyons les rives de Tande, il est 15 heures. Les docteurs et l’infirmière sont les premiers installés. Pendant que les consultations commencent, le déchargement bat son plein. Nous nous installons dans la maison du mareyeur qui fait aussi office de chef de village. Tande est surtout un village de pécheurs. Seuls 7 fermiers y cultivent 70 ares (34 hectares) de rizières. Si ces fermiers ont perdu leur bétail, presque tous les bateaux, filets et autres accessoires de pêches ont été aussi perdus. Des 70 patrons pécheurs il n’en reste plus que moins d’une dizaine ayant encore un outil de travail. Pour tous les autres, beaucoup d’habitants sont marins pécheurs d’équipage, c’est l’absence totale de travail. Jusqu’à quand? Nul ne le sait et ici pas d’allocation chômage. Leur seule ressource? La solidarité. Une fois de plus alors qu’ils ont tous tout perdu, ceux à qui ils restent un petit rien le partagent. Les enfants sourient au va et vient des porteurs, les habitants à la vision des sacs qui s’empilent. La distribution se fait en trois temps. 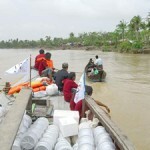 En premier celle pour les habitants des 278 familles de Tande, le village le plus important, puis celle à U TO où nous nous rendons après avoir embarqué dans deux bateaux de pêche de quoi approvisionner ses 110 familles, enfin retour à Tande pour distribuer toujours dans la maison du mareyeur les 288 familles des deux villages restants. Après avoir expliqué la bonne utilisation du produit purificateur d’eau, la distribution commence. Comme à chaque fois à l’appel de leur nom, les villageois se mettent en ligne puis entrent en file indienne tendant la gueule grande ouverte de leur sac. Nous établissons un sens giratoire: à gauche ils entrent, à droite ils ressortent le sac plein. Comme j’aimerais que vous soyez avec nous pour voir leurs sourires et leurs regards reconnaissants à la sortie. A défaut, en voici quelques images. U TO n’est pas loin, qu’à deux miles nautiques, mais n’est accessible qu’en bateau. La valse des porteurs recommence pour charger les deux barques de pécheurs. A U TO, nous nous installons dans l’école rebâtie en bambous recouverts de bâches. Même scénario de distribution, appel, file d’attente, entrée sacs ouverts, plus ils avancent plus les sacs se remplissent. A la sortie les villageois se regroupent, trient pour se répartir les charges et repartent chacun son sac sur la tête. La nuit tombe lorsque nous repartons à Tande pour y faire la distribution pour les deux autres villages selon le même dispositif. La ronde des sacs qui entrent vides et sortent pleins recommence et se poursuit jusqu’à 19h30. Pendant ce temps les consultations continuent. Nombreux sont ceux qui n’ont pas vu de médecin depuis des mois quand ce n’est pas plus car le plus proche est à plus de deux heures de bateau. Ils sont plus de 250 à bénéficier de soins et traitements. Elle m’a raconté son histoire d’une voix douce, calme, avec retenue sans jamais s’apitoyer sur elle-même et l’a finie en nous remerciant beaucoup d’apporter secours à son village qui en a tant besoin. 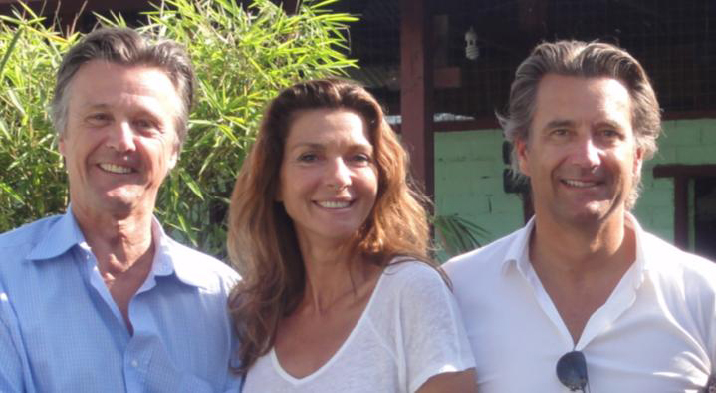 Moyenne par famille = 4 personnes. Ce budget inclus les transports, les soins et médicaments remis aux malades. Total = 675 familles x 4 personne en moyenne par famille = 2.700 personnes. 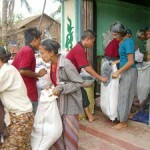 'Zawgyi Care' has been created to bring humanitarian assistance to the people of Myanmar, and in particular the victims of Cyclone Nargis which devastated the country on the 3rd May 2008.